This is an inspiring tale of supreme sacrifice and inspirational martyrdom. 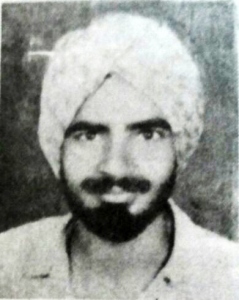 KARNAIL SINGH BENIPAL- THE Unsung Hero –the Unsung Martyr! A young man of 25, who braved bullet on his chest to free Goa from the Portuguese yoke. Born ON 9TH September, 1930 in the Isru village of the Punjab to S. Sunder Singh and Harnam Kaur, Karnail lost his father at the age of 7. His mother and older brother brought him up with love and care. He had four sisters and three brothers. At a young age, Shaheed Bhagat Singh, Shaheed Udham Singh, Shaheed Kartar Singh Sarabha and Lala Lajpat Rai proved to be his inspiration. As he walked to his school 12 kms every day, young Karnail recited revolutionary songs in the evening, collected village children and staged skits on great Indian martyrs and gave revolutionary speeches. In college too, later he was quite a student leader. Simultaneously, he took up a job as a primary school teacher to meet his college expenses and also worked at a shop as he came from a poor economic background. He took up leadership of teachers’ strike too. He became a member of the CPI in Punjab. Goa was then under the Portuguese rule. Goa Vimochan Sahayak Samiti was found in Pune in 1955 to liberate Goa. The GVSS gave a clarion call to all Indians to participate in Goa’s freedom struggle. Pandit Kishori Lal, Vishnu Pant Chitale inspired young Karnail to join Goa’s freedom movement and he enrolled himself as a Satyagrahi to liberate Goa in 1955. Karnail was married in May 1955 to 17 year old Charanjeet Kaur sister of his bhabhi. 15th August, 1955-Historic D-Day in Goa’s History. Huge processions of Satyagrahis began to march towards the Goa border. One such procession was led by a young widow from Madhya Pradesh Smt. Sahodaradevi Rai Sagar carrying our Indian flag in her hand. Chitale, Oak, Karnail were in this procession. 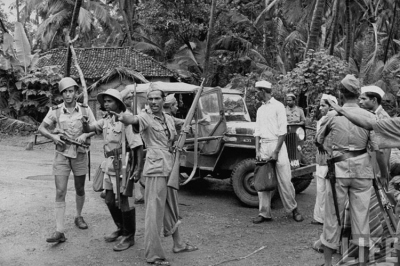 As this procession reached Patradevi, a village in Goa on the northern border in the Pednem taluka, the Portuguese ordered firing on the unarmed Satyagrahis. One bullet hit Sahodaradevi’s arm and she collapsed with the flag. Karnail Singh was at the rear of the procession. He saw this cowardly act of the Portuguese firing at Sahodaradevi. He rushed forward and tore his shirt and challenged the Portuguese to shoot at him if they had the guts instead of firing at an unarmed lady. He had rushed and shouldered Chitale from the bullet. The Portuguese shot him on his chest and the 25 year old brave gutsy lion called Karnail Singh fell down with his eyes open. This brave young lion had sacrificed his young life to free Goa from colonialism. His wife Charanjeet Kaur never married again. She lives in Ambala in Haryana. We have forgotten him. We need to celebrate this Great Hero of our freedom struggle. I feel a chapter on him in school text book is a must. We have started ‘Mission Karnail’. As a first step, his half bust, made by Sachin Magde free of cost, is being installed at Patradevi primary school on 15th August 2015 at 10 am. Long live Shaheed Karnail Singh! Jai Goa! Jai Hind! What liberation are you talking about Prajal? You know, I know and the whole world knows that our beloved Goa was Invaded on 19th Dec.1961 by the Indian Army. Now, had it been Liberation of Goa from the Portuguese, then logically India should have gone back after handing over Goa to us Goans to decide our own future, as Nehru had said in 1956 in the then Bombay: "...only Goans will decide the future of Goa...." East Bengal (now Bangladesh) can be said to have been liberated by India and given to its citizens. Whether it was politically correct or not is another matter. Not only that, India illegally occupied my Goa and had the audacity to impose a blanket law - the GDD Citizenship Act, 1962 - on us, effectively "converting" all Goans into Indians. One of the first "jobs" India did in Goa was to destroy and steal our Radio Transmitter from the Emissora de Goa at Bambolim- powerful enough then to transmit even to East Africa for the benefit of Goans there. The second was the occupation of our Airport by the Indian Navy which till date they have not given back for full civilian use. I was just a twelve year old lad then doing my 1st year of Liceum. Had I been given an option to choose my citizenship at the age of 21 (that was the adult voting age then), my life could have taken a different turn altogether like hundreds and thousands of others in my age group.